In 2011 Nigeria adopted a new and unique approach to prevent double voting. While popular, implementation of the new procedures was not universal nor without its own challenges. For the 2011 elections, INEC adopted a voting system based on the 1999 elections and recommended by civic groups. Previously, an individual would be accredited (i.e. his/her eligibility to vote would be verified) and he/she would immediately vote and immediately go home to await announcement of results. Under the new system, all potential voters would first be accredited as a group; then all accredited individuals would vote as a group; and finally everyone who had voted would be invited to remain at the polling unit to witness counting and the announcement of results. The intention was to ensure all voters would spend the entire day at their assigned polling unit. This would prevent people going to multiple polling units and voting more than once, thereby reducing the threat of illegal voting. As voters were invited to remain and watch counting the new procedures would also enhance public confidence in the accuracy of the results as announced at polling units. At 29% of polling units most or all people left after being accredited raising the possibility that they went to another polling unit and were accredited again. 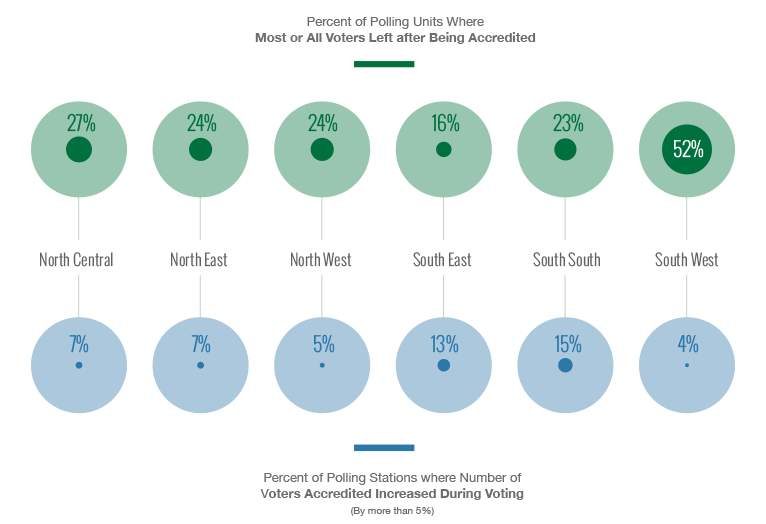 At 16% of polling units people were accredited to vote after accreditation had closed. National Average for Accreditation During the Voting Process: 8%. 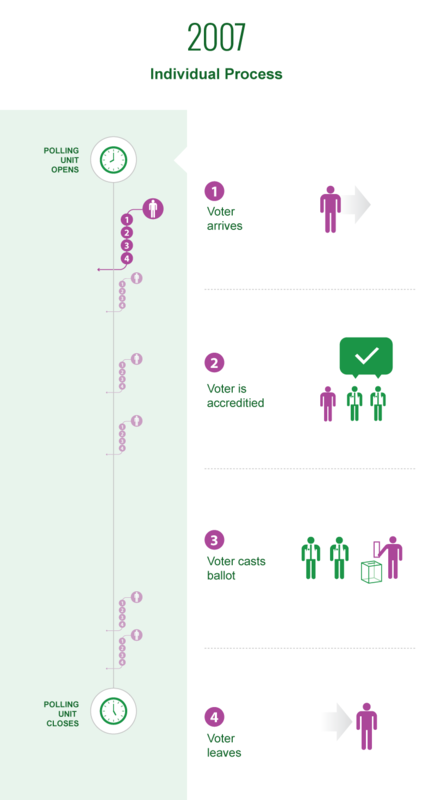 At 8% of polling units the number of accredited voters increased by more than 5% from during voting. At 31% of polling units PVT Observers reported the number of accredited voters was larger than the number of voters by 10% or more. At 28% of polling units 50 or more people were accredited during voting. According to INEC's official statistics, 451,826 voters were accredited, but only 429,549 ballots were cast. 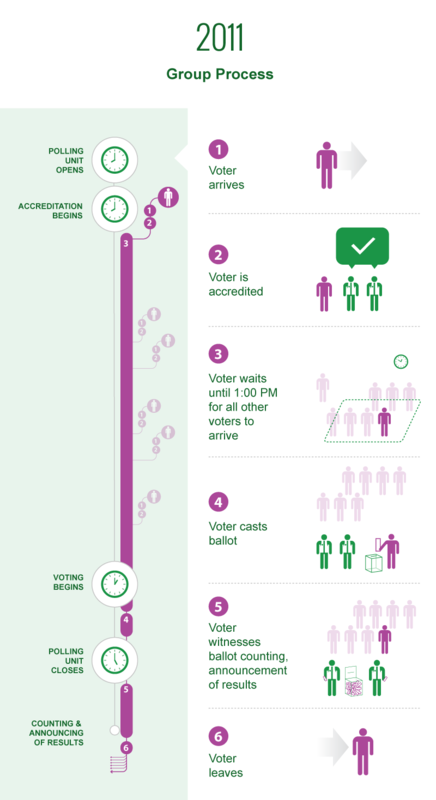 At least 22,277 (5.2%) of voters did not wait to vote after being accredited.